Edited by Hero_Of_Light at 20:53, 05 Mar 2019. -> Start a new single scenario and visit "WoG Options"
I want to thank all of Heroes Community members for their support and feedback. for their help and support with all the scripts, graphics etc. Edited by Hero_Of_Light at 01:07, 04 May 2013. The basic idea of this mod is to change around some WoG features that (in my opinion) were poorly made while keeping the original Heroes III features (mostly) intact. Since the HoL mod series were ended I thought it would be cool to work on a side project. I named it GoW intentionally, as a poetically mirrored name for WoG. First let me say that WoG had some really nice ideas and brought a completely new air in the game. It was a really groundbreaking and inspirational project. 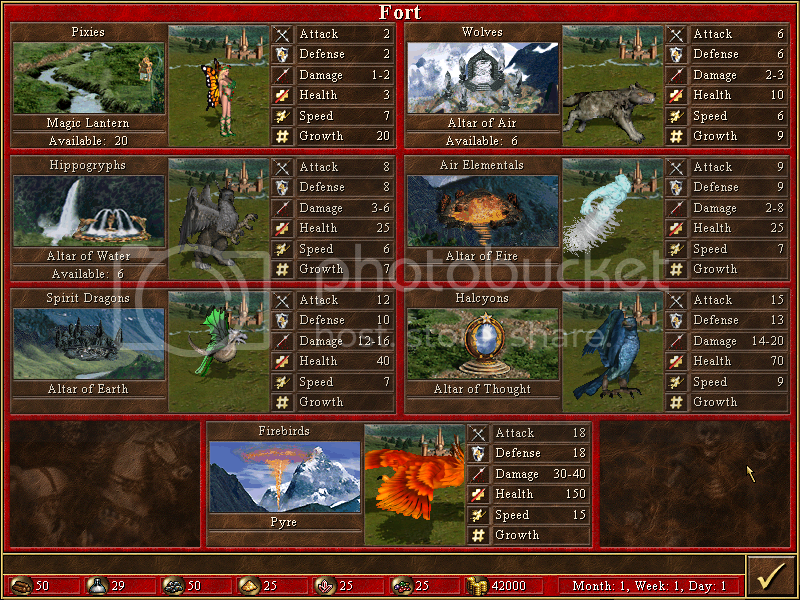 However, I think it's fair to say that most of the new graphical features (creatures, buildings etc) were poorly made. Some new creatures' concepts seemed pretty lame as well (again that's only MY opinion). As I stated frequently, my goal (in all my mods) is to add creatures that fit, as best as they may, with the original Heroes III graphics. That's what I'll try to do to this mod as well, by exchanging some WoG creatures that are poorly made. Instead of drastically changing several aspects of the game (as I did in my previous HoL mods) I thought it was high time I made a mod which mostly added features (rather than replace them). This means that the original town lineups will mostly be unaltered. The sole exception will be Conflux, in which a completely new lineup will be introduced. This lineup will be based in my latest mod's (HoLv3.22) Conflux town concept but it will have new features as well. I will be keeping most of the nice features of my previous mods. All the effort put on my previous work will be put in good use here as well. The good thing about this mod is that it will have some of the features introduced in the previous mods but there will be no obligatory WoG options and the player can enjoy the game as he or she chooses. Only a few original Heroes III features will be tempered with. Most WoG creatures/buildings that don't really fit will be replaced with better animation/concepts. A new set of single scenarios and campaigns will be introduced. New commanders, artifacts and buildings will be installed. Let's take the Elemental messengers for instance. In my opinion they were a poor concept (the game already had elementals) and a crude graphical effort (mere recoloring of Stone Golems). So, I needed a new idea for those four creatures. And here it is. Instead of a Natural Calamity, the dwelling will be a Siege workshop. The creatures will be all Castle allied and will depict various siege engines and tactical strike forces (which did exist in the middle ages by the way). 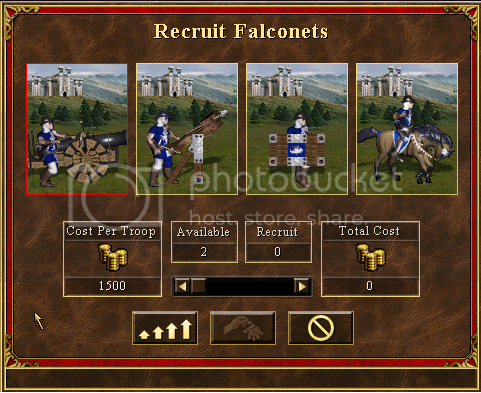 I used the Falconets and the Arbalests from my previous mods. 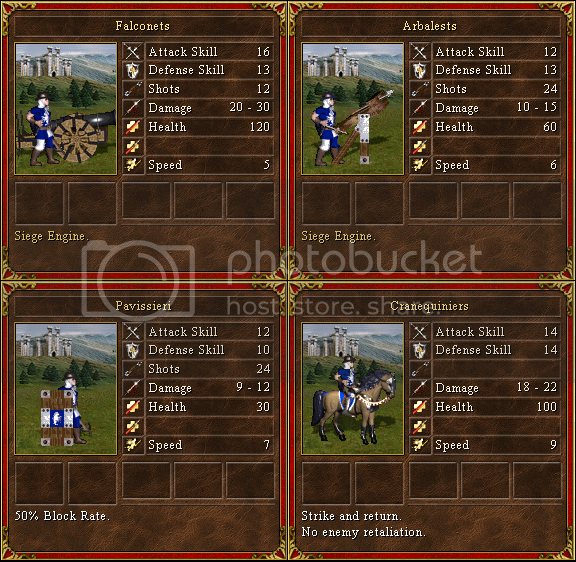 I also made a pavissieri def (crossbowmen with a Pavise) and the Cranequiniers which were an elite tactical force (mounted crossbowmen). When you visit the Siege Workshop you will be able to purchase any of these four siege engine troops. Here are the stats and abilities. This is just a small example of the new features. I will be posting further progress from time to time. Things will be going slowly though, because I am quite busy right now, but still there will be updates from time to time. "AND YOU SAY THERE IS NO GOD !!" Ok but where is a download link? I guess "when it's done"
Seriously, he said he is presenting samples of what's doing, but it's far for complete. Give him a break man! Godspeed Hol, I am sure it will be another quality mod from you. 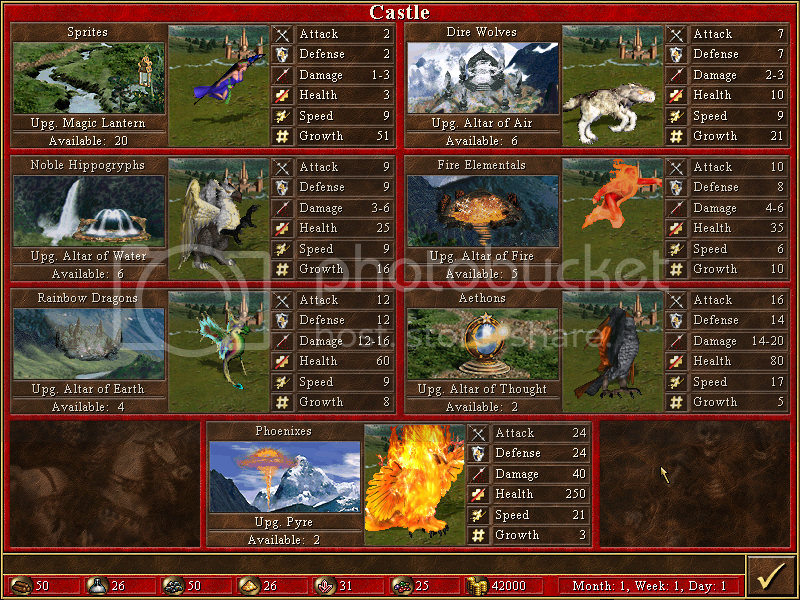 One question though, more of a wish... Is it possible for you to upload the castle units that replace the really useless messengers as a separete mini- mod? That could be a very handy change all by itself. 50% block rate for pavisieris? Usually at 30% you never get to hit them, the ability is bad coded. 50% may make them invincible or at least very annoying to kill. If on the other side, that is. Making a mini mod just for this feature is not worth it because it has too much work. A small script must be added, new graphics for creature attacks, town icons etc. I am afraid you'll have to wait for the release of the mod. There are two kinds of block rates in WoG. The one that the Dracolichs use (which is a percentage change to avoid FULL damage) and the one given through stack experience (which gives a percentage of damage reduced). I will be using the later. There will be tests of course. If the 50% block rate proves to be too powerful, I will decrease the percentage. Does this mod still keep Crimson Tides Sea creatures? No, at least not all of them. Pirates and Wenches will still be part of the mod. As I said most of WoG creatures will be changed. I'll also introduce new commanders (with a better/closer to Heroes III animation). I will have an update in a few weeks I think. Can you share Pavissieri/Cranequiniers DEF? Edited by Hero_of_Light at 22:27, 01 Jun 2013. I prepared a little update this evening... It is the town's commanders lineup. There are more new features to come. Expect further updates in the near future. As always, stay tuned for more! Edited by artu at 23:38, 01 Jun 2013. The bards definitely don't fit with Barbarian theme or Stronghold terrain at all. The Sorceresses as commanders may not be such a great idea, because I think they are one of the successful Wog creatures and I'd rather see them stay as they are. There were these Green and Purple versions of the Tower Mage, they'd look great and would fit in much better IMO. Also the look alike commanders may feel a little repetitive. Witch Doctors could use a cape. Edited by Hero_Of_Light at 01:26, 07 Jun 2013. Actually on Heroes Chronicles we learn that Bards used to sing about the tales of the Barbarians Kings of old. That's why I assigned them to Stronghold. I like the Sorceresses too. I will change them back if I get my hands to a good alternative for Tower commander. To be honest I don't really like the commander concept at all. Always when I play a WoG map I have this option OFF. However, I want to install new animations. I agree that they seem repetitive. Original WoG was quite repetitive too. You can see that in the four elemental messengers and the two additional sharpshooters that were installed. My goal would be to have new concepts and animations altogether by the time I end this mod. For instance, the Sorceresses, Bards, Succubi and Sentinels are quite original and have a decent animation... They will surely be part of the mod. If I were able to find/create original animations for the rest of the commanders that would be great. However, I must confess, since I don't really like commanders, I will leave this quest to the last (if not abandon it altogether). I've been working on the new Conflux town for some time now and it starts to take shape. It is far from finished yet, but in general some steps forward have been taken. 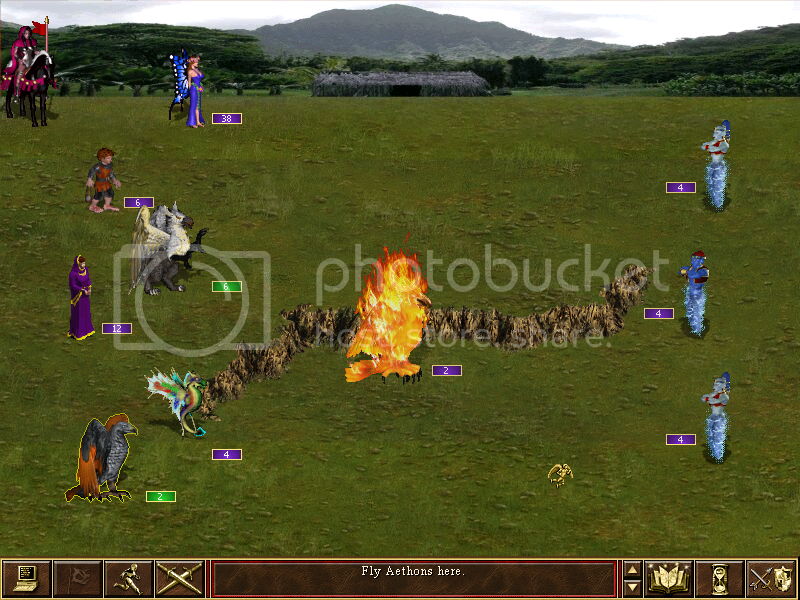 7th level: Firebirds - Phoenixes. Here is a brief town overview (again, this will definitely not be the last draft). These wolves I made from the wolf riders. The problem is that the foot of the goblins won't be easy to erase and the belly of the wolf needs to be frankensteined. The result is poor at the moment. Maybe I can try to make them better in the future I don't know. Anyways, that's that... I await your responses. Expect further updates in the future. Stay tuned! Edited by Salamandre at 07:43, 07 Jun 2013. They look great. 6 creatures out of 7 which ignore obstacles make it a top warmonger but no shooters at all? There is a shooter, the elementalists (upgraded by the elementals just like in HoLv3.22). I agree there are a lot of flyers in this town and that's why I gave it low health total and damage. Phoenixes will have a growth of two per week (and not 4). The balance of this town (and the mod in general) will be procured after a lot of testing. Right now, I work in the graphical enhancement part (along with adding some new features). I think elementals and wolves do not fit line at all. How about replacing them also? To make town of fliers - is one of old ideas. PS Maybe some shooting dragon for 7th level? Edited by Hero_Of_Light at 18:06, 07 Jun 2013. As I said I am not completely happy with the wolves animation as well. As for the elementals, I did mention that they are upgraded to elementalists (which animation fits better with the others). I think they still fit well in the new Conflux as a concept as well. Nature (in mythology at least) is made out of the four elements and so in a Haven the elementals should be in abundance. I also thought it would be cool to leave them as a memo of the old creatures lineup and the concept that they can all be upgraded in Elementalists is something I want discard so easily, cause it's way too to abandon. The creatures seem homogenous enough and fit quite better together now in my opinion. What do you thing?